Diane Correia’s first desire to play the piano came at the age of 4 or 5 when she played La Bamba over and over on a toy keyboard (La Bamba is still a favorite song). Fast-forward many years later: Diane is a wife, mother, piano teacher, and the owner of Roseville Piano Studio. After teaching for nearly 20 years and opening a commercial studio in 2012, seven years ago, Diane believes that the success of her studio is directly related to the wonderful teachers and families in her studio family. When she is not teaching, Diane can be found riding her tandem bike with her husband Mark, playing with her two dogs, Buck and Ali, or flying around the country as a part-time flight attendant. Yes, a flight attendant! Diane believes that her upbeat, flight-attendant personality and her cheerleading approach to lessons are strongly connected. Roseville has been very good to Diane and her studio. She has loved meeting so many wonderful people in her town and can’t wait to meet your family. Frannie began studying piano with Diane, many years ago, using the Simply Music© method. It was during her time at Roseville Piano Studio that she realized she wanted to teach the brilliant method that she was learning. Diane’s plans to expand the studio included Frannie, so she pursued her teaching certification and jumped on board; she began teaching in January of 2012 and has not looked back. 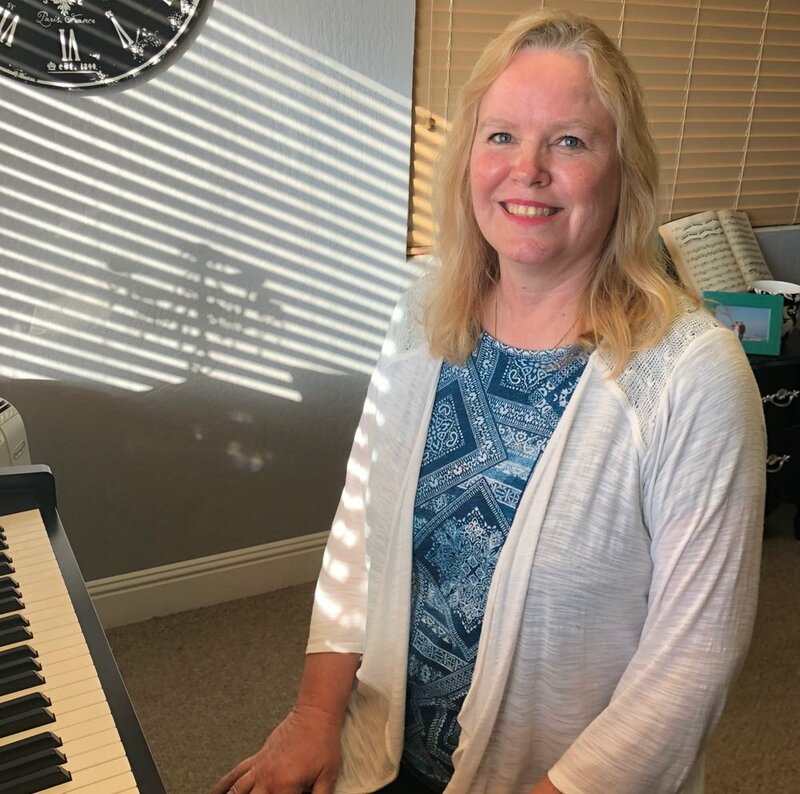 Frannie has remained an integral part of Roseville Piano Studio and has a deep appreciation for the ups and downs that come with learning to play the piano. After all, Frannie has been in the student’s shoes! Debbie Dougherty first began to play the piano in her early teens, for her own relaxation and enjoyment. After many years as a dedicated caregiver, Debbie heard about Simply Music© and loved the idea and format of the program. Debbie decided to change the direction of her career and begin teaching piano so that she could share her love of this beautiful instrument with others. Debbie acquired compassion and patience in her years as a caregiver, and this comes through in her teaching. It is important to her that each of her students play the piano for their own enjoyment as well as the enjoyment of those around them. Working with families at Roseville Piano Studio has fulfilled Debbie’s desire to spark a love of the piano in others. Debbie is excited to share her love of music with each new student in her classes.